Should You Get A Debt Consolidation Loan To Fix Debt? Should you get a debt consolidation loan?- While debt is normal for many people to have, when it spirals out of control it can become a huge worry and a source of stress and anxiety. The trouble with debt is that it is all too easy for you to have multiple borrowing streams going on at one time and if you don’t keep on track of them all separately, then you can start to fall behind. All is not lost, however, in fact, there is a way out of any debt mess, and it comes in the form of debt consolidation. First, let me explain what debt consolidation means. The idea behind debt consolidation is simple. It is a loan that is taken out to pay off other loans and finance agreements that someone may have. It is usually a more considerable sum of money and often will need to be paid off over a longer term than smaller loans. So instead of paying out multiple bills, you have all your debt in one place which makes it a lot easier for you to track. There are both good and bad points to debt consolidation, both of which should be taken into consideration before deciding whether or not it is the right path for you to choose to manage your debt. When you get a debt consolidation loan, one of the most significant plus points has to be that it allows you to keep your debt all in one place. You don’t need to juggle multiple accounts. And best of all, you only need to worry about one payment coming out each and every month. Not only this, but the chances are that having all your borrowing in one place means that the interest charged, as well as the monthly repayment amount, is much lower then what you would have been charged by making the singular payments. The cons to debt consolidation are that it should never be seen as a way to get rid of debt. The debt is still there and still needs to be paid off by you on a regular basis. All you are doing is moving it into one place and simplifying the entire debt repayment process as much as you can. If you are an overspender and take out loans or max out your credit cards to spend on more stuff that you don’t actually need, then debt consolidation isn’t for you. It won’t fix the habit that got you into debt in the first place. So it’s in your best interest that you first confront your spending habits before you get a debt consolidation loan. You must be aware that just because you have paid off the debt, doesn’t mean you’ll be able to fight the urge to live beyond your means. If you don’t work on fixing the root problem that caused spending habits, then there’s still going to be the temptation to start spending again. Because debt consolidation might give you this tremendous false sense of financial freedom; and before you know it you are overspending and borrowing again. You should see debt consolidation as a chance to make a fresh start and live as much of a debt-free life as you can. And don’t take it lightly or you will end up with even more debt if you don’t fix your spending habits. Who Should Get A Debt Consolidation Loan To Pay Off Debt? Now you know more about debt consolidation you may be wondering whether or not it is the right choice for you. If you are someone who has multiple loans, credit cards or other financial agreements, then you really could benefit from having these all in one place. Not only this, but debt consolidation could also be a good idea for those who have found they are struggling with the repayment amounts. It could also be a good idea for you if you’re struggling the frequency with which money going towards paying off debt is coming out of your account. Debt consolidation can work for you, however, much like any other borrowing, you need to approach it carefully. Think about the amount you will need to pay each month, and also ensure that you are not tempted to take out this loan, clear down your other agreements, before racking up the debt again. If you don’t want to get a debt consolidation loan, and you are worried about the state of your finances, then it is time to start living within your means. Avoid taking out more loans. Also, things such as credit cards, store cards, and even furniture financing can lead to significant debts. And these debts could take you a very long time (even years) to pay off. Stop borrowing so that you can start looking at paying off the debt that you already have and need to pay back. Get all your debt in one place. Write down everything that you owe on a piece of paper, including allowed minimum payments, interest rates, etc. Stir your debt in the eye and say enough is enough. When you write down the amount of debt, you owe you begin to gain a sense of control. Planning how much money you can put aside for debt payments will become easier with time. We all love beautiful things. You may be a car person or also into home decor. And as much as you like to cook, you do sometimes love a nice meal out with your family. However, these things are not something that you NEED, they are mere wants – or treats. Because the truth of the matter is, you can entirely live without these things if I chose to. At least until all debt is paid off. On the other side, you can’t live without things such food, water, and electricity. These are things that you need to focus on paying for every month so you can survive. The stress associated with not having enough money to pay off the ‘NEEDS’ bill is higher than that of not being able to go out for a nice meal at a lovely restaurant. Way higher. If you don’t want to get debt consolidation but still want to get out of debt, then you will have to cut down on your wants and start focusing on your needs. By doing so, you will allow yourself to have a bit of money left over to pay off your debt. Planning meals is also another way to help you save money stop overspending. 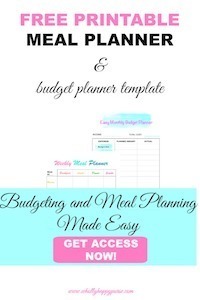 One of the easiest ways to save money is to plan all your meals. Planning prevents you from being too tempted to go to the stores daily. It even helps you curb your eating out habit. I’m a huge fan of meal planning, and I’ve been planning our meals for years. In fact, I get stressed the moment I forget to plan meals. It’s not a great feeling. And if you don’t have a planner then I strongly suggest that you get yourself one as soon as possible. I strongly recommend The Happy Planner. The Happy Planner is excellent and highly customizable. Trust me, having a good planner will help you get organized in so many different ways as opposed to not having one. I cannot recommend it enough. I have used my Happy Planner for over two years now and couldn’t be happier. Another great planner that I’ve tried is the Erin Condrin LifePlanner. Although my personal favorite is The Happy Planner as it comes with budget sheets, a meal planner, and more. If the idea of paying back your debt feels all too daunting to even think about, then the best way for you to start out would be to pay back the smallest debt first. Pay off the loans with the lowest balance first and see how great that makes you feel. And then proceed to tackle the next debt. Instead of accumulating more debt, why not find ways to make extra income instead? Paying off debt is a lot easier and a lot less stressful if you have some extra cash coming into your account. But where will the extra money come from? One way is to take on an additional job. This can be babysitting, mowing peoples lawns, becoming an Uber driver, etc. You will be pleased to know that you can also work online from home after work. Because nowadays as long as you have a computer and wifi access, you can pretty much work from anywhere. There are plenty of online and virtual roles that are popping up every day. These include virtual assistants, admin assistants, search engine evaluator, and even customer services too. All these work from home jobs pay you extra cash which you can put towards paying off your debt. And finally, why not start a blog? Blogging is a great way to start earning a good steady income online. You can monetize your blog by joining affiliate programs, advertising and through writing sponsored posts. And that’s it. I do hope this article is useful to you. If you have comments or questions regarding debt consolidation and; ways to get out of debt, let me know in the comments section below. I would like to help you out! Subscribe to get the latest content about making money, saving money and lifestyle!